Julie is exceptionally skilled and dedicated. 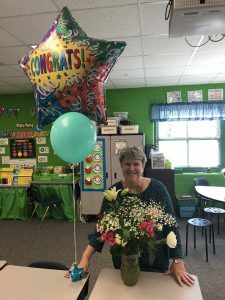 For years, she has served as the Stonehouse social studies coordinator. She works with Stonehouse teachers to ensure our students receive hands-on learning opportunities that bring history to life. She brings in speakers and organizes field trips. She participates in professional development experiences like the Colonial Williamsburg teacher institute and shares what she has learned. Though she is already very knowledgeable about what she teachers, Julie is constantly trying to find even more ways to engage her students. She even plans artifact lessons and archeological “digs” within her classroom. Julie serves as Stonehouse’s SHIP coordinator. Her strong leadership and organizational skills come in handy with the many duties that go along with being coordinator. From SHIP club applications to 5K forms – Julie handles a lot of paperwork. She ensures sponsors and instructors have what they need and buses are arranged. She communicates with parents and family members. Our SHIP club season goes smoothly because Julie is at the helm. On top of all that she already does, Julie has also taken on lead clinical faculty this year. She works with Stonehouse teachers, William and Mary faculty, and student teachers to help future teachers to prepare for the field. Having served as a cooperating teacher and mentor teacher in the past, Julie is well suited for this new position. In all that Julie does, she is always willing to help others and share resources. Part of what makes Stonehouse Elementary great is having co-workers like Julie!